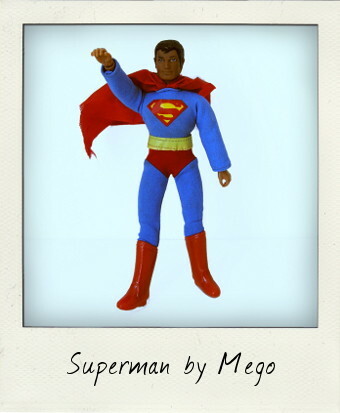 Mego Superman: Putting the Super into the World’s Greatest Super Heroes! We can rebuild him, we have the technology is a phrase we know and love from old The Six Million Dollar Man episodes, but if you're a collector of vintage Mego 8-inch action figures the expression could easily apply to any toy you are hoping to restore – it is by no means uncommon to come across loose uncarded vintage figures that have been cobbled together with spare limbs from various different figures or restored with repro parts and accessories. Late in the run of their World's Greatest Super Heroes series even Mego started producing a few oddities of its own, putting random heads on bodies which might explain this Superman gem I picked up the other day in an online auction. My Superman is in great clean shape, with nice tight limbs on a Type 2 body wearing an original costume with sewn-in red trunks, a yellow stitched belt and a red cape stitched to the collar. His head is original too – there's no copyright information on the back of the neck, but the rubber is soft and squeezable unlike repros and the paint is the dark skin tone that is typical of Type 2 Superman figures. He was missing his all important “S” emblem sticker, but that was quickly fixed by Paul at Laser Mego and his awesome vinyl decals, whilst I picked up a pair of factory repro boots from Doctor Mego – good as new! When I unbuttoned the back of Superman's tunic, however, to check out the Mego copyright information I was pretty surprised to find that he had a red torso dated 1974! Whilst I'd heard of Spider-man figures with both red limbs and torso, this was a first for me. I posted some pictures at the Mego Museum forum and within hours the fantastic community there had waded in with some really helpful suggestions. Apparently, not only Spidey came with a red torso – Human Torch and even Aquaman have been found carded with red body parts too. Although it's most likely that this is a Superman head on a red torso Spider-man body with arms and hands swapped out, he may also be a tail end figure manufactured that way. Superman did, after all, remain in the World's Greatest Super Heroes catalogue for its entire production life - ten years of toys coming out of different factories all over the world may also have thrown out the odd anomaly now and again. What ever this vintage figure's back story may be, he's taken immediate pride of place in my collection! I too picked one of these up on ebay, Looks to be all original but the head looks like no other superman and has no writing on the back of the neck either. Consensus from Mego Museum is that unless mint on a card, more than likely to be a kitbashed figure. My argument would be that I agree with what you said on your site, i.e manufacturing defect, although if you look at a superman figure, would make perfect sense, as it blends in nicely with the gap at the front of the cape, around his neck. Just like it does on Spiderman, with the red Torso, where the costume sits low, around his neck. Just a thought. Either way interesting little mystery. Hi Stephen…The original Mego Clark Kent heads were unmarked…just a thought…you might have a CK on a Superman body!